Instantly design your own tickets and badges, or upload print-ready files! Your Designs, Our Printing - It's Easy! Choose a product and begin by clicking on the orange "Customize this design" button in the options column found to the right of the product! Creating amazing looking tickets, badges, posters or flyers is easy. Choose fonts and images from our library, upload your own custom graphics or photos—even directly from Facebook and Instagram—to create the perfect product for your event, gathering, company, or shop! On any customizable product's page, click the 'Upload your print-ready files' button to upload your ready to print design/image. Select your design's image file from your computer and click Submit. You will see your image appear in the product image. Select the product options you need and submit your order! To create a new design, just click the goldenrod colored 'Customize this design' button and the product editor will open up for you to get started! You will be able to upload photos from your computer, Facebook, or Instagram from within the editor and modify the template you have selected. You can add or remove text, design both sides of the produt, change colors and anything else you need to perfect your design. When finished, submit your design, select the product options you need and submit your order. [Note] - Signing up for a FREE and SECURE account and saving your designs allows you to essentially have a reusable template to modify/re-use later on! Helpful videos are always close at hand! If you need help with especially large orders, have pre-sales questions, or need help with something else and are having trouble locating an answer on the site, please contact us! Be sure to check out our current specials! We have some smoking hot deals on badge and lanyard bundles! Need Photos or Stock Images? Over 30,000 royalty free images - A great source for your stock photo and other creative needs, 123RF. Click on their logo below to discover fantastic royalty free photos, illustrations, and more! Stand out with a unique die-cut badge shape while ensuring they cannot be easily duplicated by would be forgers. Nearly any vector shape can be used. Pictured here: Circle, Triangle w/rounded corners, Guitar Pick, Hexagon w/rounded corners, Butterfly and Rounded Chevron. 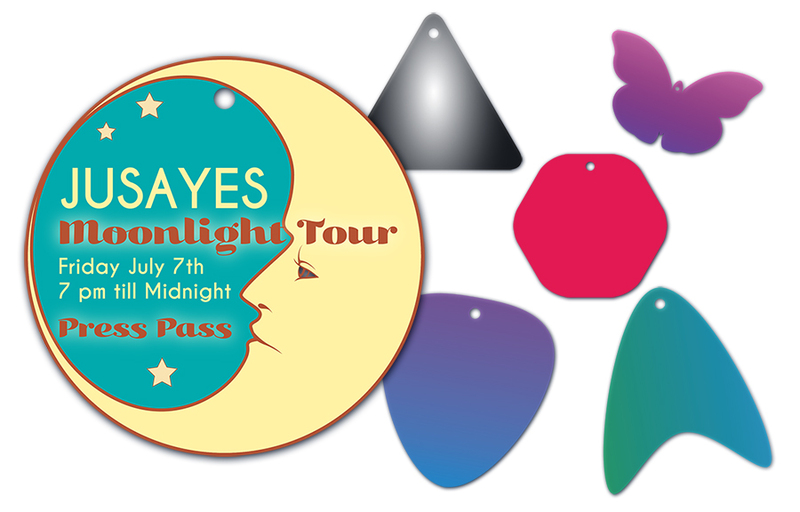 Logos are cut from holographic or metallic film and applied to your badges and passes. Imagine your custom cut company logo on your event badge! Virtually eliminates any chance of unwanted and unlawful reproduction! A wide assortment of film types and colors available but because of the nature of this kind of customization, we do not recommend requesting this feature on rush orders. Contact us by form or call 877-205-4090 for more information. 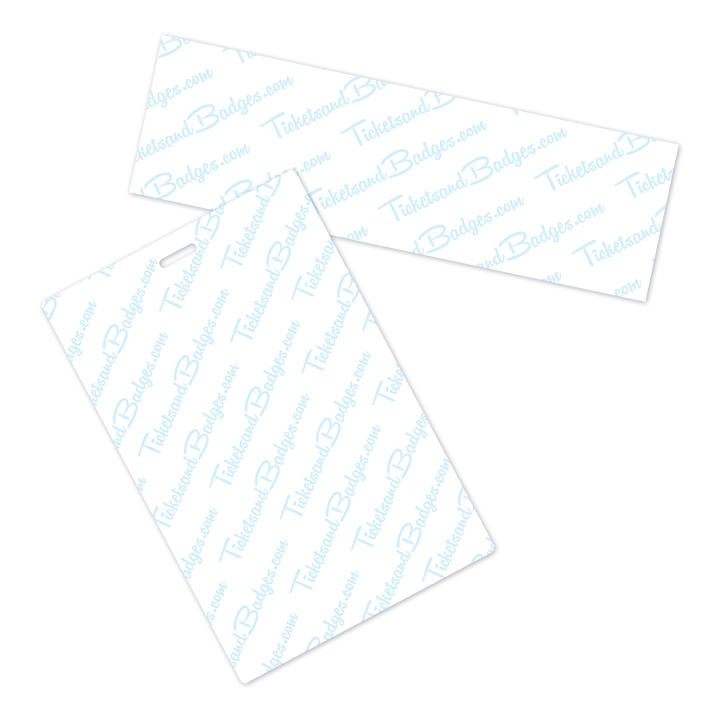 Add an extra layer of protection to your ticket, badge or pass with holographic, prism tape. Strips of holographic prism tape are glued on a ticket or sandwiched between the printed material and lamination on a badge or pass to make forgery extremely difficult if not impossible. 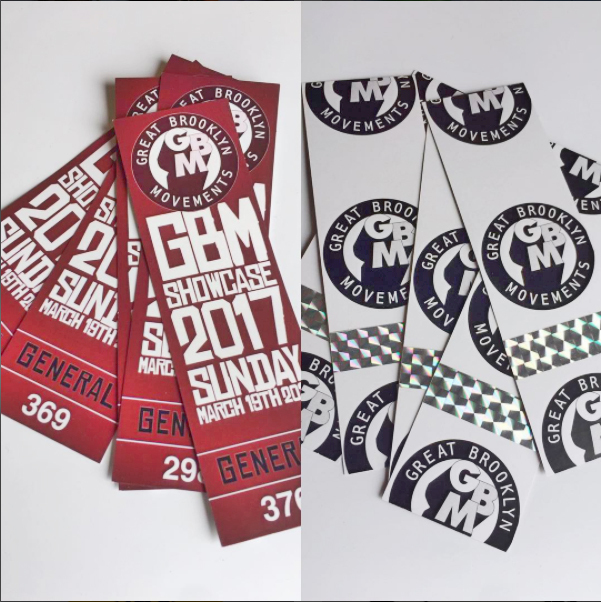 Add a custom "Non Repro-Blue" Back Print to your passes, badges and tickets and counterfeiting becomes nearly impossible. 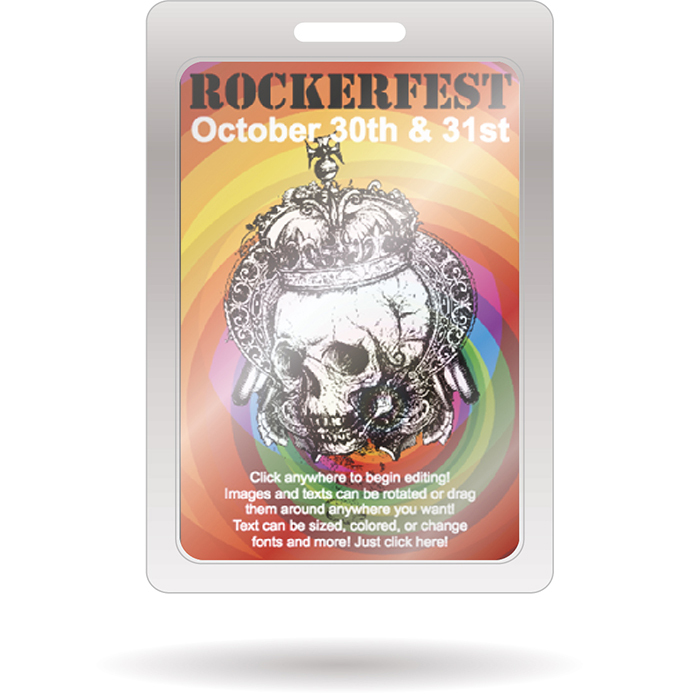 Custom back printing provides security while branding your passes/badges and tickets with your logo or other custom text and/or monochrome vector images. Tried, tested and passes with flying colors, our custom back printing can NOT be reproduced by any known conventional copiers. Increase security by including individualized names and/or picture on your badges and passes. Find out if a guest is "on the list" easily by personalizing their credentials. This is a government and military "must have". Find out how easy and inexpensive this type of security feature is. Call 877-205-4090 or use our contact form to learn more. 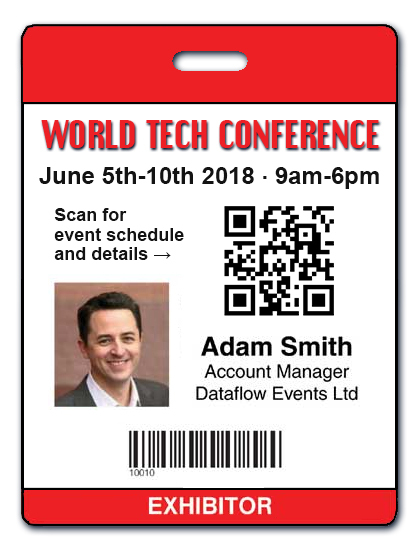 Variable data such as text (dates/times/access areas), images, barcoding, QR coding and/or serial numbering on individual passes and badges to handle incidental differences from needed credentials. Applying variable data can be used to personalize badges/passes with identification (names and photos), helps you track when a particular pass or badge comes up missing or is counterfeited, as well as controls access areas and date/time differentials for your venues and event. Radio Frequency Identification (RFID) tags/chips allow for individual badges/passes or tickets to be encoded which scans back to your database. Perform a variety of security tasks like tracking entry and exit and VIP access with the ability to revoke credentials or change access immediately. RFID is one of the most popular ways of authenticating individual credentials while retaining control over issued tickets and badges in larger venues. Readers can be hidden within an event's decor as well as utilized via hand held readers. Use at doors and other entry points to alert security breaches. Our RFID chip/tags have multiple range capabilities - Low Frequency 'LF' Passive RFID tags (134.3 kHz) which can be read up to 2 feet away, all the way up to 1500 feet (433 MHz) with Ultra High Frequency Active RFID tags, depending on the readers used. 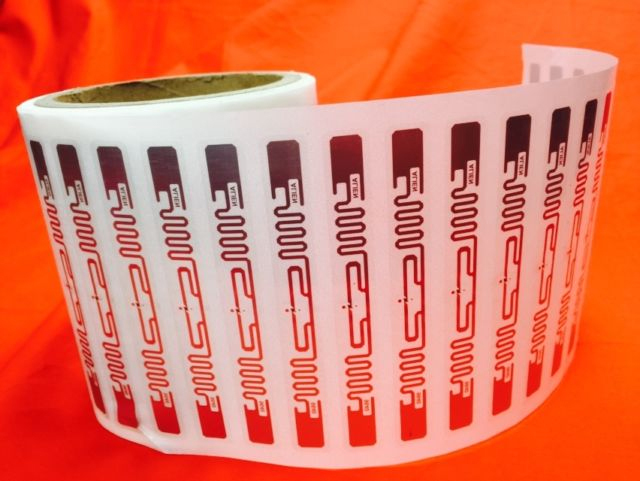 We use RAIN RFID platform ready tags to work along with popular RFID writing/reading systems & hardware. 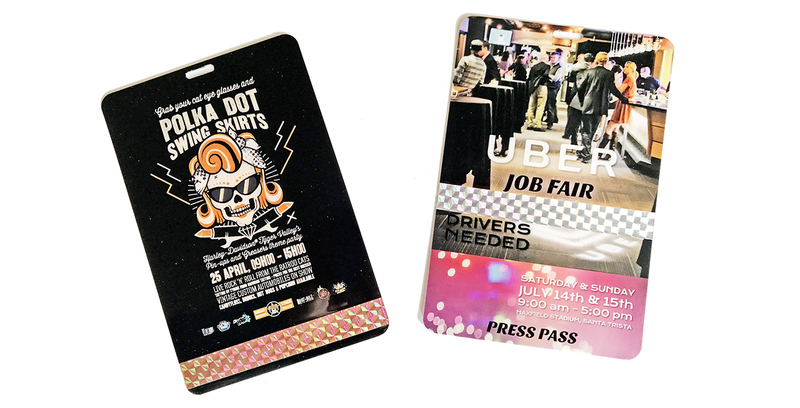 Go old-school with 10 mil pouch laminated badges and passes. Combine this type of lamination with our security features and bring back corporate cool!